Operating with meticulous planning, and employing subject matter expertise to obtain their desired goal, is one of the most enticing aspects of both the story line and production for action movies. That dedicated precision is one of the most captivating aspects of this past winter’s crime drama, ‘Den of Thieves,’ which marks the feature film directorial and producing debuts of Christian Gudegast, who also co-wrote the script with Paul Scheuring. The heist movie arrived on such Digital platforms as Amazon Instant Video, iTunes, Vudu and Google Play on April 10. 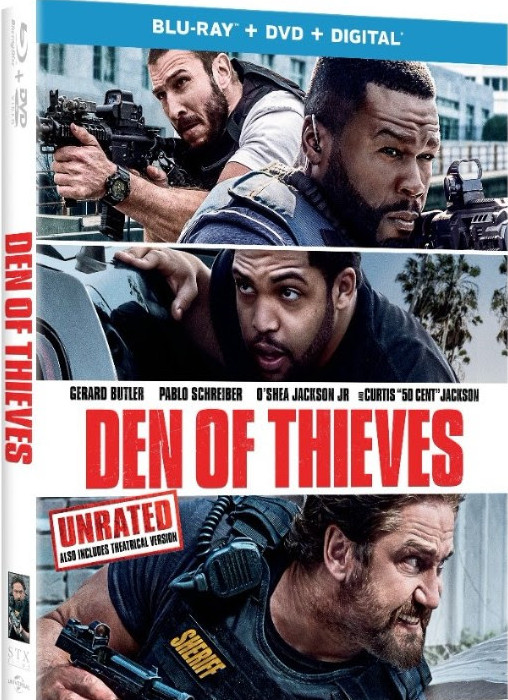 ‘Den of Thieves’ was also released on Blu-ray, DVD and On Demand this week by STXfilms and Universal Pictures Home Entertainment. In addition to both the action-packed theatrical version and the extended unrated version with footage not seen in theaters, the Blu-ray, DVD and Digital releases of ‘Den of Thieves’ also feature never-before seen bonus content including an alternate ending, outtakes and deleted scenes, and commentary from Gudegast and producer Tucker Tooley. There are also such featurettes as ‘Alpha Males,’ during which the cast describes how the tough characters in the film blur the lines between the good guys and the bad guys; ‘Into the Den,’ in which Gudegast and the cast describe the two brotherhoods within the film-the renegades and the outlaws-and their unique sets of skills; and ‘Alameda Corridor,’ where the cast and director discuss filming the intense scene that take place on the streets of L.A. and the extensive weapons training it took to film it. ‘Den of Thieves’ focuses on an elite crew of bank robbers, who plot to pull off the ultimate heist, and the hard-working gang unit of the L.A. Sheriff’s department that’s determinedly working to bring the burglars to justice. The robbers, who are collectively referred to as the Outlaws, are led by the always-in-control Ray Merriman (Pablo Schreiber). The gang operates with military precision and meticulous planning, which its members acquired from military special ops service and prison stints. The leader is joined by disciplined family man, Enson Levoux (50 Cent), and Bosco Ostroman (Evan Jones), a battle-hardened veteran and gifted thief. The Outlaws recruit a new driver, Donnie Wilson (O’Shea Jackson Jr.), an ex-con bartender who may be out of his league. However, in order to pull off the ultimate heist, the Outlaws will have to outmaneuver the Major Crimes unit of the Los Angeles Sherriff’s Department, which is known as the Regulators. The unit operates in unconventional ways that often blur the lines between criminal and police behavior, in order to bring down the most elusive and dangerous offenders. The Regulators are led by “Big Nick” O’Brien (Gerard Butler), a career detective who’s seemingly unencumbered by a moral compass. His career choices and priorities destroy what remains of his family life. But he’ll stop at nothing to put an end to Merriman’s crime spree, which has been taunting the authorities for years, due to his increasingly ambitious unsolved robberies. After a simple operation to commandeer an armored truck turns into a brutal firefight, the Outlaws become the primary target of the Regulators. Rattled by the robbery gone sideways, Merriman sets his sights on the ultimate heist: infiltrating the Los Angeles branch of the Federal Reserve to steal $30 million of unfit U.S. currency that’s being taken out of circulation before it can be shredded and destroyed. If they can pull of the heist, the Outlaws will steal money that nobody is looking for. Their extensively researched and detailed plan is set into motion. The Outlaws are forced to track down the Regulators, and anticipate their next move, before the gang can pull off the unprecedented feat of stealing from the Federal Reserve. Gudegast generously took the time to talk about writing and directing producing ‘Den of Thieves’ during an exclusive phone interview. Among other things, the filmmaker discussed how writing the screenplay, and having the production schedule become delayed several times, helped prepare him to make his feature film directorial debut. He also shared that after he initially met with the main actors who appeared in the action drama, including Butler and 50 Cent, how they easily understood, and connected with, their characters. ShockYa (SY): Along with Paul Scheuring, you co-wrote the script for the new crime film, ‘Den of Thieves.’ What was your inspiration in penning the screenplay for the action thriller together?